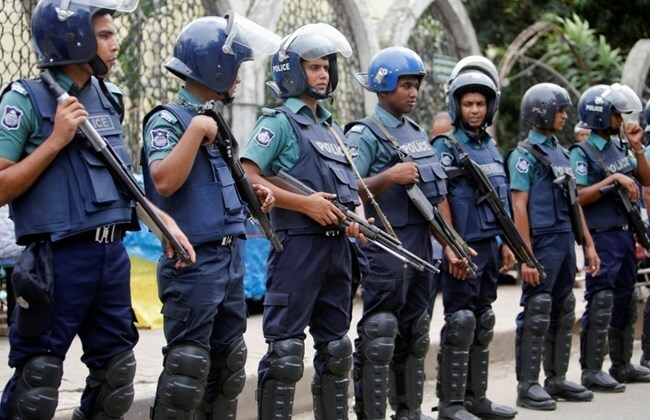 Bangladesh police, garment workers clash in protests. Bangladesh police have fired tear gas and swung batons as thousands of garment workers demonstrated for better wages for a third day, shutting down factories on the outskirts of the capital. The workers have alleged that the monthly wage in the seventh grade increased to Taka 8,000 from Taka 5,300 as per the latest gazette published by the government last year. But, the salary of the workers in other grades did not increase at the same rate. All the ruling parties of Bangladesh have no sincere intention to solve this crisis of the workers since the regimes in Bangladesh have always been in good alliance with the owners of the RMG. Interestingly, Bangladesh’s new Ministry of Commerce is Tipu Munshi who happened to be former President of the Bangladesh Garment Manufacturers and Exporters Association. When the workers are on the street demanding justice regarding their wage, the so-called growth and development saga being propagated by Awami League government is also being exposed. The so-called growth in GDP is not helping to improve the quality of life for the general people. This is also evident from the fact that the value for household consumption as percent of GDP in Bangladesh is being decreasing despite a healthy growth in economy. According to The World Bank the average value for Bangladesh Household consumption for the period 1960 to 2017 is 78.19% with a minimum of 68.67% in 2017 and a maximum of 88.88% in 1984 (source: theglobaleconomy.com). Hence, the question arises as to what benefit we can expect from this growth in GDP if we can’t ensure socio-economic justice. Only a fraction of total population and especially who is linked with the rulers are reaping the benefit from this growth while people in general are still suffering. What a weird society this capitalist system is building in our country! We witness the highest growth rate in multi-millionaires at the same time as our garment workers are out on street, struggling to fulfill their basic needs in life. It is more obvious that capitalism is a ruthless, oppressive system that facilitates the rich to become richer at the cost of the poor. So, growth in this system and its standard means nothing for the people of Bangladesh. Recently we are being bombarded with this type of reports and surveys. The regime is applying this propaganda tactic to regain the confidence of the people for this failing political-economic system. Capitalism has miserably failed to resolve the economic problem people are facing in their daily life. Yes, there has been some apparent growth in the gross domestic product (GDP) but this Western index is meaningless when it comes to poverty elimination, fulfilling people’s basic needs, creating employment opportunities and over all ensuring socio-economic justice. With the growth in GDP the country’s total and per capita foreign debt has increased over the decades. Bangladesh’s total foreign debt now stands at $31 billion while per capita foreign debt is $198 (Daily Sun, 18.06.2018). Similarly, unemployment, especially the youth unemployment has increased at an alarming rate over this period. According to Bangladesh Bureau of Statistics (BSB) in 2011, youth unemployment rate was 7.27% and that increased to 11.37% within five years in 2017. If the trend continues, the rate will become uncontrollable (The Financial Express, 08.08.2018). Hence, highlighting this sort of news in the media is nothing but an attempt to deceive us and also an attempt to delay the people’s uprising against this oppressive system. Sheikh Hasina has monopolized her totalitarian regime for another term by extraordinary election rigging on December 30, 2018. Her regime is controlling people’s affairs very ruthlessly which is resulting in gross discontent among the general masses. This regime cannot even tolerate people’s comments against it in the informal social media. It is arresting general people for this kind of insignificant actions by filing cases in the draconian digital security act and treating them as notorious criminals. The popular comment on democracy by Abraham Lincoln – “government of the people, by the people, for the people” has once again been proved to be an illusion. Democracy is in reality ruling by the elites, for the capitalist, and not for people at all. And so we are observing in the democratic countries, particularly in Muslims countries, despotic regimes which ruthlessly persecuting general masses and depriving them of basic rights. Democracy, the legacy of the colonialist ruling, is the thus the tool of the colonialists to give legitimacy to the tyrannical regimes like Hasina.